The Ivory-Bill interacts with a lot of organisms by helping them or by hurting them. Beetle larvae thats lives and grows in trees is eaten by the Ivory-Bill. This is a predation because one organism is dieing to feed the Ivory-Bill. 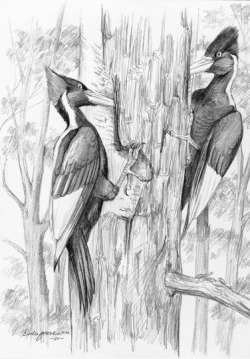 Since the Ivory-Bill is a woodpecker it gets most of its food from eating insects from trees. Since the bird is harming the tree by digging holes into it and the Ivory-Bill is helping the tree because its removing harmful bugs it should be called a Mutualism. When organisms fight over resources between animals of different species. The Ivory-Bill would fight over trees because this is the main thing that it needs. A tree contains its food, shelter, and its family. This is when animals in the same species fight over food. The Ivory-Bill would fight over many basic things like food and water but it would also fight over the best nest positions. A tree that has a lot of beetles would be fought over while a nest in a small tree probable would not. The reason the Ivory-Bill doesn't want a small tree is because it has large wings it wont be able to move around freely.